Are we out of the woods as far as economic growth is concerned? Is the Indian economy on track to accelerate from here on? A month ago, the general consensus was that the worst was over and things were going to get better from here on. The Index of Industrial Production (IIP) was steadily inching up. The economy seemed to have finally got over the disruptions caused by demonetisation of specified banknotes in 2016 and the implementation of the Goods and Services Tax (GST), which was rolled out in July 1, 2017. Core sector growth seemed firmly on the growth path. Inflation had been tamed. Finally, the bidding for assets of the 12 big cases, which had been referred to the National Company Law Tribunal (NCLT) under the Insolvency and Bankruptcy Code (IBC), gave hope that animal spirits were back, at least as far as the cash rich companies were concerned. Since then, fresh worries have cropped on the hurdles to faster economic growth. The big fear is about the repercussions of a trade war between the US and China. 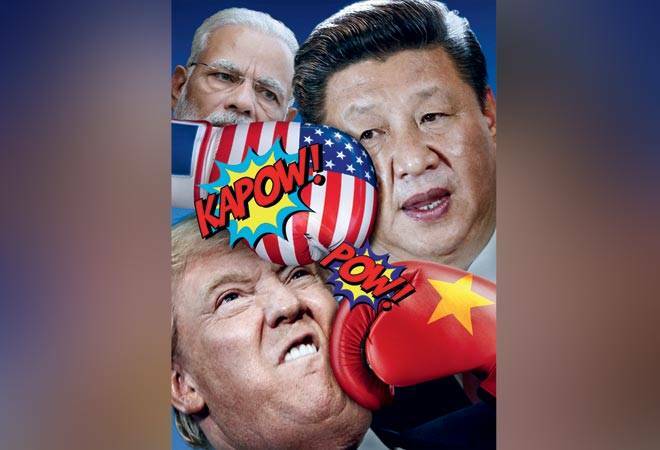 US President Donald Trump, after threatening measures against countries that he perceives to have an unfair trade balance against his country, has now unleashed a flurry of protectionist measures. The first one was the 25 per cent duties on imports of steel and aluminium from most countries bar a few allies like Canada and Mexico. He followed that up by slapping additional tariffs on 1,300 goods worth about $50 billion imported from China. In turn, China has retaliated by slapping higher tariffs against a host of US imports, and has threatened to do more. The China tariffs could end up hurting a host of US exports ranging from soyabeans to Boeing aircraft. The Indian economic growth could get hit three ways because of the new American tariff barriers. The first is simply through the steps the US takes directly against India. These include the new, stringent norms for H1B visa applications, which have already seen Indian applications fall by almost 50 per cent. This could raise the cost of doing business for Indian IT services companies. More importantly, the US Trade Representative (USTR) has come out with a new report on a wide range of issues – from agriculture subsidies to intellectual property rights to technical standards – which it thinks is harming US exports and business with India. Trump has also accused India of putting high import tariffs which harm US manufacturers like Harley Davidson. Finally, there is the worry that the higher US tariffs on a range of products could end up creating an environment where there is oversupply in a range of industries, and hence, dumping of these products to India, which in turn will hit hard domestic manufacturers of those goods. But the trade war is only one of the worries. The latest PMI in manufacturing shows that manufacturing growth could be hitting a speed breaker once again. The growth in manufacturing sector decelerated to a five-month low in March as per the Nikkei Manufacturing Purchasing Managers Index. Companies saw shrinking orders and production growth in spite of managing to keep price of finished goods under check. This, in turn, is signalling a warning sign for the labour market, which has anyway seen anaemic job creation in the past four years because of the disruptions created by both government polices as well as technological innovations. There are a couple of other potential dangers on the horizon. The first is that crude prices will rise further, creating problems for India’s current account deficit (CAD), as well as inflation and import bill. The CAD has started moving up already, and it is slated to go up further in the coming financial year. Then there is the prospect of slow agricultural growth in case of irregular rainfall and climate changes. Finally, there is the worry that if the GST revenues do not look up quickly enough, the government may either miss even its revised fiscal deficit target or it may cut expenditure to meet its fiscal deficit target. The latter would hit both growth as well as job creation. The immediate future of the Indian economy seemed fairly good a couple of months ago, but now danger signals are showing up on the horizon.